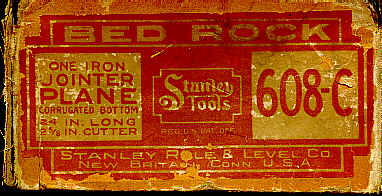 In a world where good enough usually ain't good enough, Stanley decided to produce another series of metal bench planes, called Bed Rock planes. These planes are, for all intents and purposes, nothing but a variation of the more popular Bailey series. They all have an adjustable frog, the brass depth adjustment knob, the lateral lever, a lever cap, rosewood knob and tote, etc., just like the Bailey's. The key difference between the two designs is found in the way the frog mates with the bottom casting. For such a seemingly minor difference, the Bed Rock planes were offered at a premium over the Bailey's, and it was a design that never seemed to be very static nor nearly as popular as Stanley's wildly successful Bailey line. Since the primary difference between the two models is in their frog designs, most of what follows is paid to that minutiae. If you don't wanna be stuck in the quagmire of frog design, best find something else upon which to ponder, like modern day uses of the amazing fiberboard planes, the #193A, #194, etc. The Bailey frog underwent several modifications in an attempt to make it seat better, and cheaper (each and every frog, and its receiving part of the bottom casting, had to be machined for a proper fit). By about 1900, the frog design had pretty much evolved into the design that most of us handtool fundamentalists recognize - the angled bottom that mates to the bottom casting at two areas, one along the rear of the mouth and the other at a raised crossbar that spans the interior width of the bottom casting. In other words, the frog does not mate with the bottom casting over the entire area of the frog's bottom. So someone at Stanley, Justus Traut (the dude who gave us the #45, et al), sniffed out a marketing opportunity here. What if a plane were offered that had a frog design where its entire bottom mated with a corresponding area in the bottom casting? There's sure to be megabucks reaped with this design. Or so Stanley thought. The series was a dud when compared to the numbers of Bailey planes sold, and it did have its bright spots, but it, like so many other attempts to build a better mousetrap, also went belly-up after some 40 years of production. First, the basic frog design of the Bed Rock needs explanation. The bottom casting has a sloped and machined area onto which the frog seats, for its entire length. The frog itself only differs from the conventional Bailey design in that its bottom is flat and fully machined. A side view of the frog yields a wedge-like appearance. There is one other subtle detail about the frog design - the frog's bottom forms a broad and flat tongue, which fits into the bottom casting's broad and flat groove. This was provided to prevent the frog from shifting side to side, and guaranteed that the frog would move at a right angle (to the mouth) when the frog was adjusted. So there you have it, a frog that mates with the bottom casting over its (the frog's) full length and is self-centering as well (this design remained static during the entire production of the Bed Rock series). Sure woulda made me want to spend the extra 50 cents (average price difference) to buy one of these babies back ca. 1900. Someone else at Stanley, Edmund Schade, invented a little gizmo that found permanent use on all Bed Rocks and was latter added to the Bailey line. It's a lucky thing, too, that he did invent this otherwise it probably would have been impossible for Stanley to justify the Bed Rocks; i.e., it may have been more difficult to convince the tool-buying masses that the difference between the two lines was of any great significance. This little gizmo, first offered on the Bed Rock planes from their inception, is a little frog adjustment screw that engages a captive fork secured to the back of the frog. 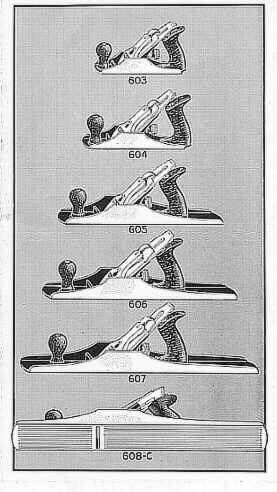 This feature was more of a gimmick than anything else, but it soon found favor amongst hand planers across America. By giving the screw a turn, the frog moved either forward or backward. Frog screwing, thought the stuff of the plane lover's fancy, soon swept America, and it was inevitable that this mechanism would be added to the Bailey design, which it was ca. 1910. It really is a wonder how planedudes survived without this feature for the previous 30/40 years, but they did. The true merit of this feature was proved when, during WWII, some of the Bailey planes were offered without this. Think Stanley's complaint department had its phones ringing off the hook over this? 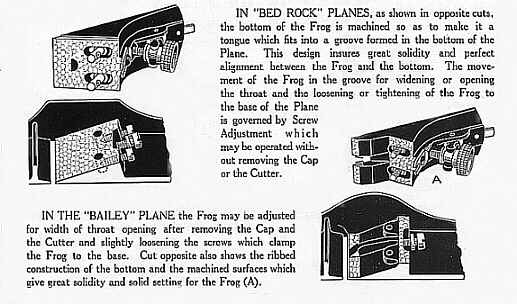 The introduction of the frog adjusment screw to the Bailey series left the Bed Rocks without any real distinguishing pizazz, other than the bright red label used on the boxes of the planes, as the lever cap still had to be removed to gain access to the screws (that secured the frog to the main casting) in order to adjust the frog in the first place. To address this, the New Britain stinktank (tm) had to come up with some other gimmick to differentiate the Bed Rocks from the Baileys, and what they decided upon was the capability to adjust the frog without removing the lever cap and iron. Hey, think how much Joe Meatball's daily existence was bettered simply by saving him from having to remove the lever cap, and then backing off the two frog securing screws to adjust the frog, something that's done at least once or twice a month or two. But, guess what? This swell feature had already been solved a few years earlier by one of Stanley's main competitors, Sargent, located in New Haven, CT, just a short trip south of New Britain. On July 3, 1906, John Shaw received a patent for frog adjustment without having to remove the lever cap and iron assembly. This innovation was soon 'copied' by Edmund Schade, who came up with another way to accomplish the same function, on March 14, 1911. Stanley surely must have perceived some threat from Sargent over this, although the Sargent line of planes incorporating Shaw's patent aren't all that common. For a detailed look at Shaw's patent, click here. Schade's novel way of frog adjusting was accomplished by the addition of two frog clamping screws that flank either side of the frog adjusting screw. Each of these screws is pointed (on the end without the slot) and engages two pins which have a corresponding conical depressions milled into them. The pins fit through the frog and into the bottom casting, and have no holding power by themselves. The two screws apply a downward force on the pins when they are tightened, thus locking the frog securely in position. By backing off the screws, the pressure on the pins is relieved, and the frog can be moved forward or backward by turning the frog adjustment screw. It's a neat and efficient frog adjusting mechanism, but its real merit is somewhat questionable since frog adjusting is not something done with any regularity, like, say, adjusting the plane's set (depth of cut). Click here to see a blow-by-blow description from the hands of Stanley's propaganda machine. And speaking of the plane's set, that's exactly what changes whenever the frog is adjusted forward or backward. Since the frog and its mating surface are inclined toward the mouth, the frog moves closer to or farther from the mouth as it's adjusted forward or backward respectively. With the iron secured to the frog, it follows, then, that the iron likewise moves closer to or farther from the mouth. Adjusting the frog forward increases the set, and adjusting it backward decreases the set. Now, granted, the amount by which the set is changed is small, but when using a smoother for finish work, or using any bench plane on a very hard wood, the slightest change in the set needs to be accounted for after the frog is adjusted, so there is really no true reduction in the number of adjustments to the plane as the frog is repositioned. On the plus side, however, you have another mechanism for adjusting the iron's set should you ever break the adjusting fork - who would have guessed that Stanley invented fault tolerant planing without their ever realizing it? At the same time the new frog securing screws were added, the bottom casting itself underwent a change in appearance. Where the casting rises up around the frog, on either side of the frog, the tops are lopped off flat, instead of the normal round sides found on the earlier Bed Rocks and the Baileys. This change was advertised as adding significantly to the strength and stiffness of the plane as well as affording an increased area when the plane is used on its sides, a claim that is rather dubious as Bed Rocks can be found with cracks about the main casting in this supposed strengthened area. WWII spelled the end for these planes, as it did for many other tools that Stanley had offered for years. Most of these tools were on life support anyway, and the war was the final nail in the coffin, the Bed Rocks included. Other than the stuff I list above, there are some other telltale ways to date your Bed Rocks. Chief among the other ways is the lever cap and its embossing. The earliest models have "STANLEY/R. & L. Co./BED ROCK" cast in three separate lines (that's what the / means). Starting around 1910, the lever caps have "STANLEY/BED ROCK" in two lines. A few years later, just "BED ROCK" is cast. From ca. 1925 onward, "STANLEY" is all that appears. There are other differences in the models, but they are minor in the grand scheme of things here. What follows is the actual Bed Rock models. These parallel the Bailey planes in function. As with those planes, the "C" designation means that the plane has corrugations in the sole (for reducing friction as the plane forms a vacuum with the wood); the "C" doesn't appear on the plane. These planes can suffer the same general damage that the Baileys can, and for a description of that damage, refer to the #3 of the Bailey series. The Bed Rocks can also show damage about the frog clamping screws - sometimes you can find them with their slots broken in which case you'll need to find replacements. Only three of the planes in the series are considered anywhere near scarce, the #602, #602C, and the #605 1/4. However, there is a premium paid to acquire any of the planes when buying from dealers. This, in the author's opinion, is due to the hype found within some books and articles. If you want a better plane, and one that's less costly, go with the Type 2 Bailey's. These are the best planes what Stanley ever did make. #601 Smooth plane, 5 3/4L, 1 1/4"W, 1 1/4lbs, 2000-?. Stanley never made one, but The Superior Works is. You can buy one yourself by clicking here. There's a lot of stuff going on below the frog of the later Bed Rocks, and it's very apparent on this, the smallest planes of the series, when you try to jam a screwdriver down there to screw around with the frog. Still, they are popular planes with collectors and users of today, probably owing that to their unique look where everything is scaled down to make the plane look rather cute. Be careful for counterfeit corrugations on this one. 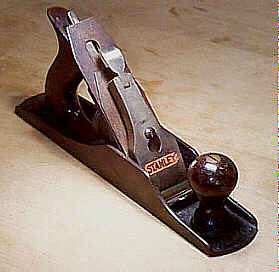 It's one of Stanley's scarcer planes, especially in the round top configuration, which opens it up for the crafty tool artisans to apply their handiwork. #603 Smooth plane, 8"L, 1 3/4"W, 3 1/4lbs, 1898-1943. #603C Smooth plane, 8"L, 1 3/4"W, 3 1/4lbs, 1898-1935. #604 Smooth plane, 9"L, 2"W, 3 5/8lbs, 1898-1943. #604C Smooth plane, 9"L, 2"W, 3 5/8lbs, 1898-1935. #604 1/2 Smooth plane, 10"L, 2 3/8"W, 4 3/4lbs. 1898-1935. While many users fancy this plane as a fine worker due to its heft, they aren't especially enamoured with the price tag that usually accompanies the tool. 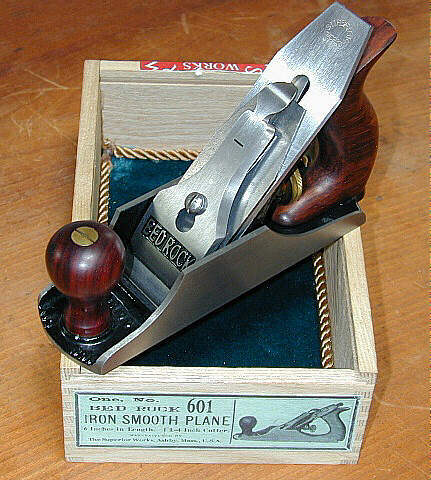 If it's heft you want, and you have the money to buy this guy, save your lunch money for a few months more, and buy a real killer smoothing plane, an English infill. You'll never regret it as they far out-perform any Bed Rock plane. #604 1/2C 10"L, 2 3/8"W, 4 3/4lbs, 1898-1935. #605 Jack plane, 14"L, 2"W, 4 1/2lbs, 1898-1942. Probably the most commonly encountered size of the Bed Rock series. #605C Jack plane, 14"L, 2"W, 4 1/2lbs, 1898-1935. This plane is one of the scarcest of the entire Bed Rock series. Note that this model can't be found with the earlier round sides as it wasn't introduced until after the series underwent the design change of the flat top side and the frog clamping screws. 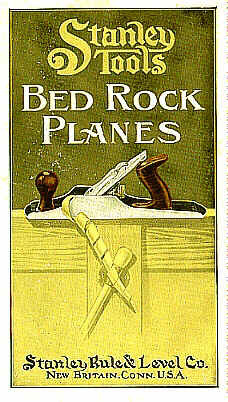 Because the #605 1/4 is the Bed Rock equivalent of the Bailey #5 1/4, which was a plane favored by the trade schools for manual training, and because the Bed Rock planes, plane for plane, were sold at a premium price over the Bailey equivalents, it follows that these planes didn't sell well to the trade schools, thus accounting for their scarcity. However, the planes were bought by some school districts, and it's possible (or was possible) to find stashes of these planes in schools. Stanley never offered a corrugated version of this plane in their catalogs. This doesn't mean that they wouldn't possibly make one upon special request, as Stanley did for other stuff, but if you ever see one, I'd be damn sure it was legit before I plopped down more than $100 for it. As an aside, I once bought over 200 of these from a fellow who found a pile of them in Milwaukee. That city was closing its trade schools, and a hoarde, rivaling the Staffordshire Anglo-Saxon hoarde, was found. And, I didn't even buy them all, as the guy sold many to other guys! #605 1/2 Jack plane, 15"L, 2 1/4"W, 6 1/2lbs, 1898-1935. Pay attention to this, and the corrugated version's, iron. It's non-standard with the others in the series, and if you're in need of a replacement, you'll have to snag it from a similar vintage #5 1/2 or a #27 1/2. #605 1/2C Jack plane, 15"L, 2 1/4"W, 6 1/2lbs, 1898-1935. #606 Fore plane, 18"L, 2 3/8"W, 7 3/8lbs, 1898-1941. The nearest Stanley got to designating a single plane with the sign of the beast, 666. Push one of these suckers backward over some oak and you'll hear Ozzy Osborne chanting "norm is god, norm is god, all hail norm, prince of darkness and everything that's wrong with the world!" #606C Fore plane, 18"L, 2 3/8"W, 7 3/8lbs, 1898-1934. #607 Jointer, 22"L, 2 3/8"W, 8 3/4lbs, 1898-1943. #607C Jointer, 22"L, 2 3/8"W, 8 3/4lbs, 1898-1935. #608 Jointer, 24"L, 2 5/8"W, 9 3/4lbs, 1898-1940. #608C Jointer, 24"L, 2 5/8"W, 9 3/4lbs, 1898-1935.